As she looks back over a life in music, Bertile Fournier Huguet begins her programme with Henriette Renié’s Contemplation, now 110 years old. This beautiful, tranquil piece, composed in 1898, and Renié’s earliest composition for solo harp, was dedicated to Madame la Baronne de Rochetaillé, whose daughter, Camille was the 23-year-old Renié’s pupil. “Penser Harpe, c’est penser Henriette Renié” (To think of the harp is to think of Henriette Renié) wrote Lily Laskine in 1981. Born in 1875, and a pupil of Alphonse Hasselmans from whose Conservatoire class she graduated at the age of eleven, Henriette Renié dominated the French harp scene throughout the first half of the twentieth century, her students including Marcel Grandjany, Mildred Dilling, Susann McDonald and Harpo Marx! Bertile Huguet had her first lessons with Henriette Renié at the age of nine and then, entering the Conservatoire, she continued her lessons with Lily Laskine, being awarded a brilliant Premier Prix at the age of seventeen. As she looks back over a life in music, Bertile Fournier Huguet begins her programme with Henriette Renié’s Contemplation, now 110 years old. This beautiful, tranquil piece, composed in 1898, and Renié’s earliest composition for solo harp, was dedicated to Madame la Baronne de Rochetaillé, whose daughter, Camille was the 23-year-old Renié’s pupil. The moving occasion for its first performance was the ceremony of dedication of a chapel at the Baroness’s home, the magnificent Château de Contenson. Two influences are apparent, on the one hand in the opulent, lush harmonies reminiscent of César Franck, and on the other hand in the harp writing, reminiscent of the ‘three-handed’ technique pioneered by Parish Alvars. Bertile Huguet had the privilege of studying this score with the composer herself, and her precious copy of the music is liberally marked with Renié’s pencilled annotations as to interpretation and technical matters. She later arranged this piece for three harps, and this version was recorded by the Sextuor de Harpes de Paris, directed by Bertile Huguet. Next follow two of Debussy’s best known piano pieces in transcriptions for the harp. Renié considered Debussy’s music, with its long resonances and veiled harmonies, to be ideally suited to transcription for the harp, but listeners will be surprised and puzzled to hear the famous First Arabesque transposed down a semitone. Whereas Debussy’s music is in E major, Renié’s version of 1906 is in E flat, a key better suited to the harp, where the strings can ring freely without being affected by the mechanical interference incurred by the operation of the pedals. Her next transcription does not present the same problem, as the transcription is direct and in the same key as the original. La fille aux cheveux de lin is the eighth from Debussy’s book of Twelve Preludes, all composed between December 1909 and 1910. In the original edition the pieces were not given titles, the only instruction to the performer at the beginning of the piece being that it should be Très calme et doucement expressif. The ‘titles’, which were meant to create images or sensory associations in the listeners’ aural imaginations were appended only at the ends of the pieces. The line la fille aux cheveux de lin which inspired this delightful piece comes from a poem by Leconte de Lisle published in his Poèmes antiques: chansons écossaises (in imitation of the Scottish poet Burns) of 1852. C’est la fille aux cheveux de lin/ la belle aux lèvres de cerises (It’s the girl with the flaxen hair/ the beauty with the cherry lips). Although born in Namur, Belgium, from the age of eleven Félix Godefroid was brought up in Paris where, in 1825 he entered the Conservatoire as a student of F J Naderman, newly appointed Professor. Erard’s epoch-making double-action pedal harp had been available in Paris since 1815, but the retrograde Naderman insisted on promoting only the outmoded single-action harp as made by his family’s firm. Disenchanted, Godefroid left him in order to study the double-action instrument with Théodore Labarre, and a brilliant career followed. His Danse des Sylphes, composed when he was only 24, and the present transcendental Étude were always sure-fire winners.Berlioz called him ‘un mâitre de son instrument’ (a master of his instrument). La Jeune et la Vieille most probably draws its inspiration from a fairy tale with a moral ending by the French fabulist Fénelon. His Histoire d’une vieille reine et d’une jeune paysanne (Story of an old queen and a young peasant girl), written in 1857, begins “Il etait une fois une reine, si vieille, qu’elle n’avait plus ni dents ni cheveux.. elle ne voyait goutte; même avec ses lunettes… (Once upon a time there was a queen, so old that she no longer had any teeth or hair…. she couldn’t see a thing; even with her spectacles …). The old queen yearns for renewed youth and beauty while Péronnelle, the beautiful peasant girl, yearns for privilege, riches and the queen’s crown. Both characters are easily recognised in this most unusual piece. Next come a group of transcriptions of Italian music from a very much earlier period. Organist, composer and violinist Michelangelo Rossi, known as ‘del violino’ was born in Genoa in 1601 or 1602. Moving to Rome in 1624, and becoming a pupil of Frescobaldi, he was fortunate enough to receive the protection of the powerful Barberini family, and in 1633 his first opera, Ermina sul Giordano, was staged at the theatre of the Barberini Palace. Subsequently he received the patronage of the most important families of Northern Italy including that of Duke Sforza and of the Este family, but by 1649 he had returned definitively to Rome. The cover of the first edition of his Ten Toccatas and Twelve Courantes is stamped with the arms of the Barberini family. Rossi may well have known both the double and triple harps then available in Italy, but it is from his collection of pieces for organ and harpsichord that the Allegro played here is taken. Although less concerned with the accuracy of Urtext editions than contemporary scholarship demands, Henriette Renié was one of the very earliest to transcribe music of this period for the harp. Bertile Fournier Huguet remembers, as Renié’s young student, being set the task of copying this music by hand. Originally in G major, Renié’s transcription is in G flat. Born in the same year as Bach and Handel, Naples-born Domenico Scarlatti’s was a precocious talent. At the age of fifteen he was appointed to the post of organist and composer of the Royal Chapel (Cappelle Reale) in Naples with special additional payment for the post of clavicembalo di camera, suggesting that his particular talent as a keyboard player was already evident. By 1714 he was Maestro di Cappelle Giulia at St Peter’s, Rome, but in 1817, sponsored by the Marquis de Fontes, Portuguese ambassador to the Vatican, he left Italy for the Portuguese court, where he taught Maria Barbara, the daughter of João V. Ten years later, Maria Barbara married the Crown Prince of Spain, and Scarlatti followed her, first to Seville and in 1733 to Madrid, where he spent the rest of his life. In Portugal and Spain he was known as Domingo Escarlate, and his only published work on the Iberian Peninsula was a volume entitled Essercizi per gravicembalo (Lessons for harpsichord), dedicated to João V, and composed as a gesture of gratitude for the Knighthood bestowed on him in 1739. Nearly all in binary form, these sonatas opened a new world of keyboard technique. The famous Pastorale is transcribed into a key more suitable for the harp. The third composer of the Italian baroque to be included here is Domenico Zipoli. Born in 1688 in Prato, he was yet another contemporary of Bach, Handel and Scarlatti, and indeed, in 1709 he was briefly a pupil in Naples of Alessandro Scarlatti, Domenico Scarlatti’s father. Disagreements led to his seeking other teachers in Bologna and Rome, where he settled. In 1715 he was appointed organist of the Jesuit church at Rome and the next year he published the keyboard collection on which his fame rests, the Sonate d’intavolatura. It was as one of 53 prospective Jesuit missionaries, intent on christianizing the ethnic Guarnari Indian population that he set sail from Cadiz to South America on 5 April 1717. A violent storm at sea obliged the party to disembark at Buenos Aires, whence they went on to Cordoba with its Jesuit College and University. In 1724, after six years of study there, Zipoli was qualified to receive priest’s orders, but, suffering from tuberculosis, he died at the Jesuit monastery of Santa Catalina before he could be ordained. Alphonse Hasselmans (1845-1912) was Henriette Renié’s teacher. Born in Liège (now Belgium), he was a pupil of Gottlieb Krüger (a pupil of Elias Parish Alvars) and moving to Paris in 1877 he became a student of Ange Conrad Prumier, whom he succeeded as Professor at the Paris Conservatoire. He taught there from 1884 and the list of his pupils is a veritable roster of brilliant virtuosi from Marcel Tournier (1899), to Carlos Salzedo (1901), Micheline Kahn (1904), Marcel Grandjany (1905) and Pierre Jamet (1912, the year of his death). Henriette Renié received her Premier Prix in 1887, when she was only eleven years old. Prélude no.2, written in 1902, is the only one of the Three Preludes (op.52) to have been published. In the Spring of 1907, Henriette Renié was asked to accept a commission to write a piece suitable for the annual Conservatoire concours. Deeply upset, and overwhelmed with grief by the sudden death of a near relative, she was obliged to renounce the commission, and Fauré’s Impromptu (op.86), commissioned for the 1904 concours was substituted at the last minute. The harp piece that eventually resulted only in 1913 was the Pièce Symphonique en trois épisodes, of which the Marche Funèbre (Funeral March) was the first. This lovely movement, which can be played separately, is a moving expression of Renié’s inconsolable sadness and her intense feeling of personal loss. In complete contrast come two pieces by Marcel Grandjany, Henriette Renié’s favourite pupil. Born in 1891, he was a pupil of hers from a young age, and although it was a cause of much friction between Renié and Hasselmans when the young boy entered Hasselmans’ class at the Conservatoire, he continued to have lessons with her. Because of his talent, she taught him without remuneration. He won his first prize at the Conservatoire in 1905 with her Concerto in C minor. Accepted as a candidate for the prestigious Prix de Rome in 1913, Grandjany was forced to withdraw because of illness, so he turned to the innocent nursery rhymes of his youth, and set two of them to music. Et ron, ron, ron, petit patapon is the nonsense refrain of Il était une bergère, the story of the little shepherdess, her sheep, the cheese she made from their milk, and her naughty kitten. Le bon petit roi d’Yvetôt is always a favourite showpiece for young harpists. In the seventh century, the town of Yvetôt in Normandy established its independence. The King of Yvetôt wore a crown, and up until 1789 there was a prince’s guard, identifiable by their red uniform, white waistcoats and black hats. The innocent-sounding nonsense words beloved by French children were written by Pierre-Jean de Béranger in 1813, and belie their original hidden political agenda. La Boite à Musique (The Music Box) is a delightful encore by Franz Poenitz, a highly gifted virtuoso harpist, who, at the same time, was a composer with an opus of over 80 pieces, a virtuoso on the harmonium, an excellent painter, and who, it is said, excelled at all kinds of sport. Born in Berlin, and adopted at the age of two, he was taught the harp by Louis Grimm (another pupil of Parish Alvars). Aged 7, he appeared in Berlin as a wunderkind, aged 11, he made a very successful concert tour in the Scandinavian countries, and his first compositions were published before he was 15. From then until his death he remained in Berlin at the Royal Opera, and he was one of the famous group of seven harpists employed by Wagner in Bayreuth. Few of his compositions are played today, but some, like this one, and his amusing Spukhafte Gavotte for two harps deserve the attention of today’s harpists. La Source (op.44) by Alphonse Hasselmans is one of the best-known pieces of the whole harp repertoire. It was a favourite solo of Lily Laskine, who studied it with him while she was his Conservatoire student more than a hundred years ago. Many of Hasselmans’ transcriptions, pieces and studies have a didactic purpose and were intended for the use of his pupils. This includes the charming Fileuse, the ever-popular Rouet and the delicious Follets (Will o’ the Wisp), which is in fact a study in disguise! Even the gorgeous La Source (The Spring or The Fountain) is in effect a concert study on descending arpeggios – but the evocative title and the brilliance of the piece have ensured its appeal and its success with audiences the world over. The last two pieces on this CD are the only ones to have been written by non-harpist composers. Prokofiev’s diary for 1913 reveals that his Prelude was written at the beginning of his fascination with Eleonora Damskaya, a harp student at the St Petersburg Conservatoire who was to become his muse and his close friend. His diary entry for 28 March describes ‘Damskaya …. clinging on with a plea that I should write a piece for her to play. I promised I would.…. At home I started on a Prelude for harp, which came together quickly and promised to sound effective … At home [later] I sat up until a quarter to one finishing off the Harp Prelude, after which I played it through five times and, hugely delighted with myself, went to bed’. From inspiration, therefore, to completed composition in one day! Prokofiev later included a version of the original harp piece in his Ten Pieces for the Piano op.12. The (Harp) Prelude in C is no.7. This scintillating display piece became very popular amongst French harpists in the Conservatoire Harp classes of the 1950s and 1960s, when the professors were Lily Laskine and Pierre Jamet. Gabriel Pierné, composer of the enchanting piece which ends this recital, won the Prix de Rome in 1882 at the age of nineteen. Returning from his mandatory three years at the Villa Medici in Rome, the 22-year-old returned to the Paris of the belle époque and attempted to make himself known on the fashionable soirée de salon circuit. It was for a salon concert at the home of Madame Provinciali-Celmer (herself a harpist) that he composed his first version of the Impromptu-Caprice. In 1900, in consultation with Hasselmans, it was revised, extended and embellished with passages of a more virtuosic nature, and adopted as the required set piece for the Concours of 1900. In 1903 Henriette Renié gave the first performance of Pierné’s one movement Concertstück under the composer’s direction, but this earlier piece has the delicacy and charm of a painting by Watteau or Fragonard. With this recording the essence of a whole epoch of harp playing is brilliantly evoked and restored to life. In Bertile Fournier Huguet’s words: ‘This CD is dedicated to the memory of my two wonderful teachers, my husband, recently deceased, and to my children and grandchildren who have so often listened to me playing these pieces. Making it gave me the greatest joy’. A musician by family tradition (both her mother and her grandmother being harpists), Bertile Fournier-Huguet had the advantage of being taught by Henriette Renié and Lily Laskine, both of whom made a enormous and distinguished contribution to their art both in France and abroad. Having been awarded a unanimous Premier Prix of the Paris Conservatoire at the age of seventeen, Bertile’s career was set to start from a solid foundation. Beginning by playing with chamber music ensembles, the quality of her solo work was soon recognised and she was awarded with a principal prize in the First International Harp Contest held in Israel in 1959. Engaged as solo harp by the Lamoureux Orchestra, where she remained for 37 years, she broadened her horizons on foreign tours with the orchestra. She has played under the direction of conductors such as Igor Markevitch, Charles Munch, Paul Paray, Leonard Bernstein and many others. 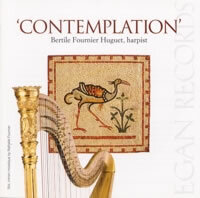 In 1976 Bertile Fournier-Huguet formed the Sextuor de Harpes de Paris, a group composed of brilliant former Premier Prix of the Paris Conservatoire (CNSM), and an ensemble whose performances have always been received with the greatest acclaim by audiences at World Harp Congresses and elsewhere. In 1987, she was invited to become a member of the Board of Governors of the World Harp Congress. After the death of Lily Laskine in 1988, as her legatee, Bertile Fournier-Huguet resolved to perpetuate the memory of this exceptional artiste, and to ensure the continuity of the movement which was so dear to her heart: that of helping young harpists at the beginning of their careers. So it was that in 1989 she founded the Association of the Friends of Lily Laskine, a society which organises annual memorial concerts with performers of true distinction; following this, in 1993 she established the Concours International Lily Laskine. Held triennially, and intended to attract young competitors, both French and foreign, within a few short years this event had achieved parity with the long-established contests held in Israel and the USA. Bertile Fournier-Huguet has taught at the Conservatoire Européen, the Schola Cantorum and Paris’s Conservatoire du Centre. She is often invited to participate as a member of contest juries at both national and international levels. In December 2006 she was nominated to receive the distinction of ‘Chevalier dans l’Ordre National des Arts et des Lettres’ (Knight of the National Order of Arts and Letters).